Light Cruiser. First British warship sunk by a submarine in WW1. 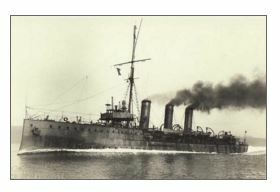 Sank on 05.09.1914, – torpedoed out from the Firth of Forth by German Submarine U-21. A single torpedo hit the forward magazine, causing it to explode, and Pathfinder sank in just four minutes. There were seventy survivors from a crew of 570.